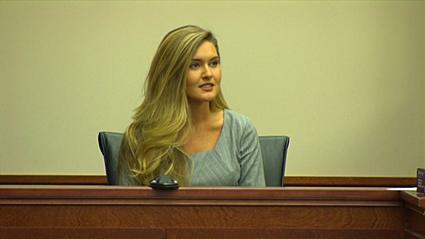 Miss USA 2012 2nd Runner-up a key witness in murder trial! A former Miss USA contestant finds herself at the center of a sensational murder trial making headlines around the nation. Former Miss Ohio Audrey Bolte had a date with a handsome Ryan Poston, a 29-year-old lawyer. But prosecutors say that on the night of their hot date, Poston’s longtime girlfriend shot him six times in a jealous rage. The former Miss Ohio was called to the stand this week and testified she was looking forward to her date with Poston, but he didn’t turn up. Audrey was second runner up in the 2012 Miss USA pageant. You may recall she made a famous gaffe, saying Julia Roberts character in Pretty Woman, a prostitute, was a good role model for young women. “A wonderful, beautiful woman, Julia Roberts! And she was having a rough time but you know what, she came out on top and she didn’t let anybody stand in her path!” Bolte explained in the pageant. Twenty-four-year-old Shayna Hubers, on trial for murder, is being called the new Jodi Arias. Like Arias, she claimed her boyfriend was violent and she shot him in self-defense. The dead man told his stepfather he was worried about how Hubers would react when he told her about his date with Miss Ohio. Deeksha Kaushal- Miss Diva 2015?